Alternative Spring Break Trip gave Ivy Tech students opportunity to tour Washington D.C.
LAFAYETTE- While some students used spring break to relax or catch up on work, a group of Ivy Tech Community College-Lafayette students spent it touring Washington D.C and meeting government officials. 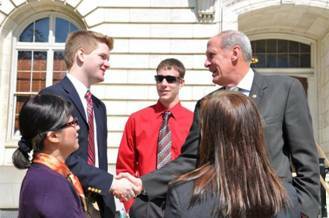 Alex Johnson shaking hands with Senator Dan Coats. The Alternative Spring Break Trip gave student leaders and those interested in a career in public service the opportunity to learn firsthand about the role of government in society, meet elected representatives and tour sites of the Capitol. Eight students, including several student ambassadors, took advantage of this opportunity. Over their two day stay, students met with several prominent officials and public figures, including Representative Todd Rokita, Senator Dan Coats, Senator Richard Lugar, and Brian Lamb from C-SPAN. Many of these visits offered students the chance to ask questions and gain insight into the many roles each official plays. 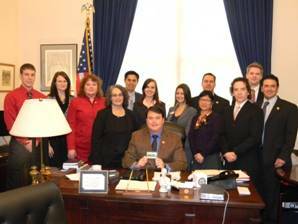 Photo of students and chaperones with Representative Todd Rokita. Pictured (from left to right): David Edwards, Sonya Claiborne, Julie Stewart, Janet Perkins, Andrew Antonio, Jessica Bell, Erica Maslanka, Geoff Knowles, Lee Chiang, Michael Plouviez, Alex Johnson and Dr. David Bathe. A unique opportunity presented itself during their meeting with Representative Rokita, when the students were able to view a presentation outlining the nation’s future budgeting issues that he had created for a budget meeting that same day. Another notable visit was with Brian Lamb of C-SPAN. According to Andrew Antonio, Executive Director of Diversity and Engagement for Ivy Tech-Lafayette, the opportunity to tour the C-SPAN set and learn about living and working in such a political atmosphere was a truly enlightening experience.